Nyx Book Reviews turned 6 years old this month! I originally wrote this post on Irresponsible Cactus, but decided to cross-post it here as well. It has been over a month since I last blogged on Nyx Book Reviews. It has been over two since I last blogged on Irresponsible Cactus. One day I was here, and the next, I disappeared. Or at least, my digital presence did. I turned silent, and that silence has been pressing on me since. I love blogging. I love reaching out with my words and my mind and to create a little slice of me that others can read and relate to. I love to entertain you, I love to interact on Twitter and meeting new people and chatting with the familiar ones. Blogging and writing have been a huge part of my life in the last six years and I would not have it any other way. But the truth is, dear reader, that I can’t at the moment. And that makes me feel like a failure in some ways. Why can’t I just open that browser and put some words down? Even if I can’t do it every week, why not at least a few times a month? Why can’t I answer comments and post tweets, or, what weighs even more on me, answer the letters some lovely bookish friends sent me? I’ve done it before. I’ve done it for years. Why can’t I just do it now? I can pinpoint some key moments where I started to realize that no, I was not well. I was not dealing with the stress. I was not handling it. I was not fine. So I culled down on anything that wasn’t completely essential in my life and faced the issues that I had been suppressing, in some cases, for multiple years. Though I’m glad I did it, these last few months have been absolutely terrible. All energy I have goes into setting things right both in my mind and my life, and in trying to keep up with school. Even the smallest tasks beyond that are out of my reach. I’ve had days in which I just sat on the couch for six hours straight, doing nothing and feeling overwhelmed. Hell, I still can’t bring myself to do the dishes, even though it’s so easy and takes so little work but even that small household task feels like it’s too much. Everything takes energy, and I have none left. On some days I feel better, and on some I slip backwards. I’ve made many changes, and one of the most important ones is that I no longer want to lie and pretend I’m doing just fine, thank you. People can’t help you if you’re not honest. I can’t help myself if I’m not honest. So I’m here today, dear readers, to break through that silence I’ve maintained here and on my other blog. Though generally because I simply couldn’t write, it was also an embarrassed silence. It was easier to disappear than to give a reason why. I’m here to tell you today that I’m not fine, and that’s okay. The Sunday Post is a weekly meme hosted by Kimba from The Caffeinated Book Reviewer. 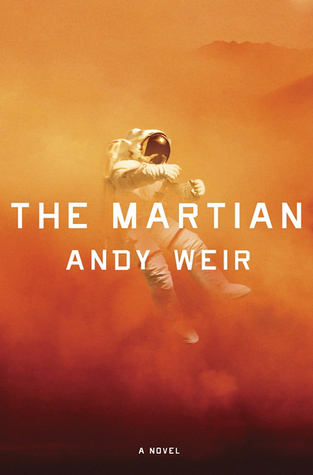 A while ago I read the science-fiction bestseller The Martian. Though I can see why people love it, I didn’t adore it as much as the majority. I’m also answering the second round of questions for the Rosemary and Rue readalong we’re having. 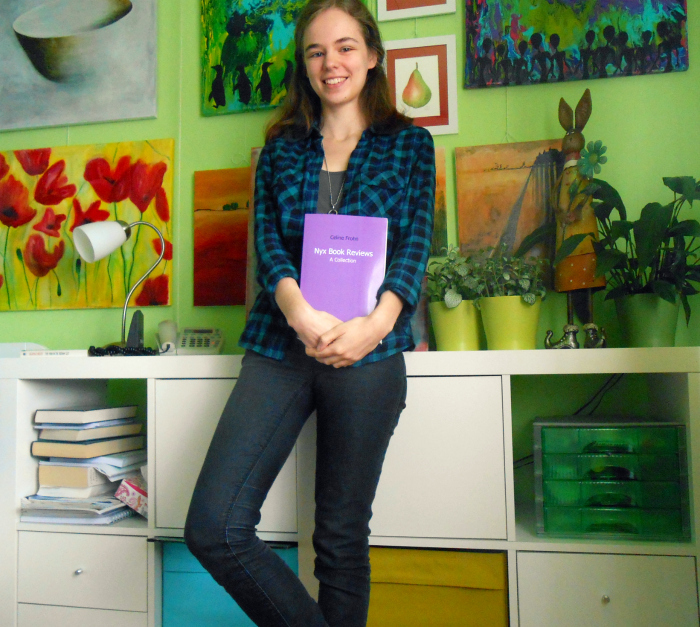 The book is pretty exciting, very high-paced urban fantasy. I’m looking forward to reading the rest of it. You know who the best Marvel super hero is? She’s seriously awesome, has the best sidekicks, and cannot be beaten even by the worst baddies. 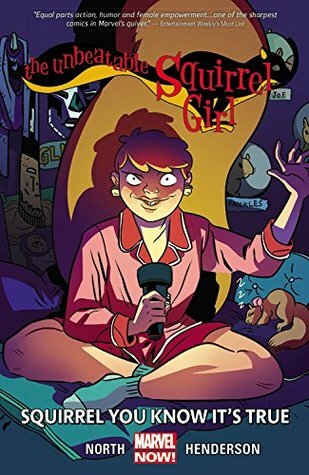 Unlike all of the gritty noir comic heroes, Squirrel Girl is upbeat and funny and cartoony and full of awesomeness. This is the second volume, and though I wasn’t as blown away by it as the first, but it was still very cool. Together with a bunch of awesome ladies, we are reading Seanan McGuire’s Rosemary and Rue. Every week we will discuss a few chapters based on some questions. This week we read up to chapter 14, and the host is Lynn from Lynn’s Books. To find out more about SF/F Read Alongs or to join, check out our Goodreads group. Or, learn more about the book we are currently reading. While Devin was quite the way I expected him to be – self-centered, slightly creepy yet kind of loveable, Sylvester was more… excitable than I was picturing? I think throughout the book he has been the first character to be truly happy to see Toby, and he doesn’t seem to be suspicious at all (while all the other fae character seem to be a bit off). This complicates my theory that he might be involved in Evening’s murder! I’m quite interested in the name. Is it a hope chest because it provides hope to changelings? Because fae hope it existed? Some other reason? It does seem to be a rather powerful magical object with a bit of a mind of its own, which always makes things interesting. Well, I personally would never entrust anyone I hate with something that important, but Toby didn’t really have any other choices. It would be too easy to put it with her known friends. To be honest I liked it because there was more Tybalt time. I’m not fully aboard the Tybalt-train, but we’re getting there. 4. We experience the reaction of other members of the fae to the murder of Evening and Toby telling them about the Queen’s reactions – did their reactions give you any clues at all? Raysel might be the only person more broken than Toby herself. I wonder what happened to Raysel and Luna while they were away for twelve years – I feel like they might have been trapped by that Simon guy, only not transformed into a fish. Luna is an awesome character, I like how she is some kind of pro gardener. Poor Toby. Chapter fourteen makes for a fantastic cliffhanger, doesn’t it? I definitely feel like someone is going to rescue her, but I have no idea who yet. Are you reading with us? Alas, the ending is in sight! I handed in one big boy of an essay this week and will have to finish the other by Friday. And after that, my dear friends, there lies an oasis of DOING ABSOLUTELY NOTHING for at least one whole week. There will be reading and Netflix and all the sleep. It’s going to be wonderful. I’ve been thinking about my blogging schedule, and I might mess around with that a bit. It would mean a lot to me if you could take a minute to answer these four questions regarding my blog. They’re multiple choice, so you’ll be done in no time at all. Thanks! I got The Girl from the Well from my absolutely awesome Secret Sister as a present and read most of it in a bath tub in Milan. I feel like I have a special connection with this book now, ha. And it’s a good ghost story featuring Japanese mythology, so definitely check it out! Kate Karyus Quinn has been on my radar ever since the fantastic (Don’t You) Forget About Me. 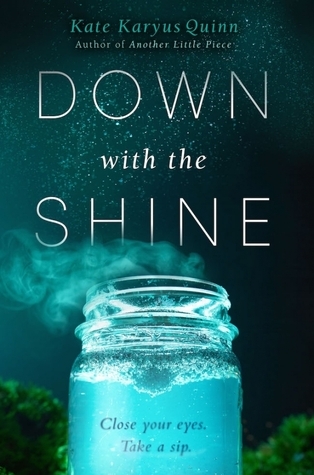 It was one of my favourite books of 2014, so I was thrilled that HarperCollins was so kind to provide me with a review copy of her newest book, Down With the Shine. This book has quirky characters, a relatable voice, humour, and just the right amount of bleakness. Its release date is still a while off, but I recommend keeping your eyes out for this one if you enjoy young adult novels with a magic twist. Horror books in the YA genre often seem to be a rather flimsy excuse for smooching in dark corners rather than providing actual scares. The Girl from the Well does not fit this picture at all, featuring no romance to speak of and scenes reminiscent of popular horror movies like The Ring. Okiku is a vengeful spirit. She is compelled to hunt those who have killed children, giving them their deserved horrible death. She has subsided in this manner for centuries, but when she notices a boy with strange tattoos, the monotony of her existence is shaken up. Interestingly, The Girl from the Well is mostly told from Okiku’s point of view, yet the focus of the story is not Okiku herself but rather Tark and his cousin Callie. Tark’s story is slowly revealed while Okiku observes the humans, seldom interfering herself. In a way, this was rather unsatisfactory – there is little room for emotional depth because Okiku only observes actions. The reader is constantly reminded of a distance between themselves and the characters. Additionally, I would have loved to learn more about Okiku and her past. Many readers aren’t very enarmoured with flashbacks, but I think in this case more insights into her past would have strengthened the narrative. The upside of Okiku’s point of view is that The Girl from the Well is written in a highly visual manner. Combined with a subject matter – Japanese mythology – that is relatively in the public conciousness through horror movies such as The Ring, the book provides some very hauntingly familiar images. 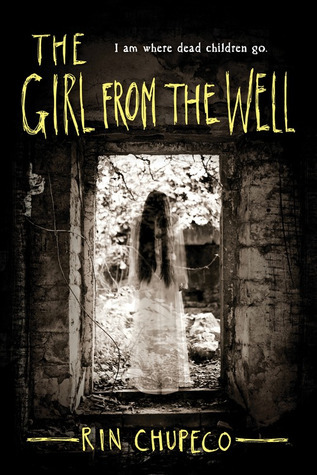 Very creepy though ultimately never truly scary because of the distance between the reader and the characters, The Girl from the Well is a short but enjoyable read. Especially its basis in Japanese folklore makes the novel worthwhile. Hello dear readers! I hope you are all well and that you have enjoyed the last few weeks. It’s been a bit of a struggle to get back into the day to day routine. I’m currently finishing up an essay and trying to come up with a thesis proposal. Right now I’m considering doing my thesis on the penny dreadfuls, little books about vampires and murder and mayhem from the nineteenth century. The last book in the Parasitology trilogy, Chimera, is a worthy conclusion to a lovely science-fiction trilogy. Mira Grant is the pen name of Seanan McGuire, whose book Rosemary and Rue we are reading with a bunch of people over at SF/F Read Alongs. It’s not too late to join, should you be interested. With a new year comes a whole slew of resolutions. This week I’m talking about why I don’t make any resolutions at the start of January. 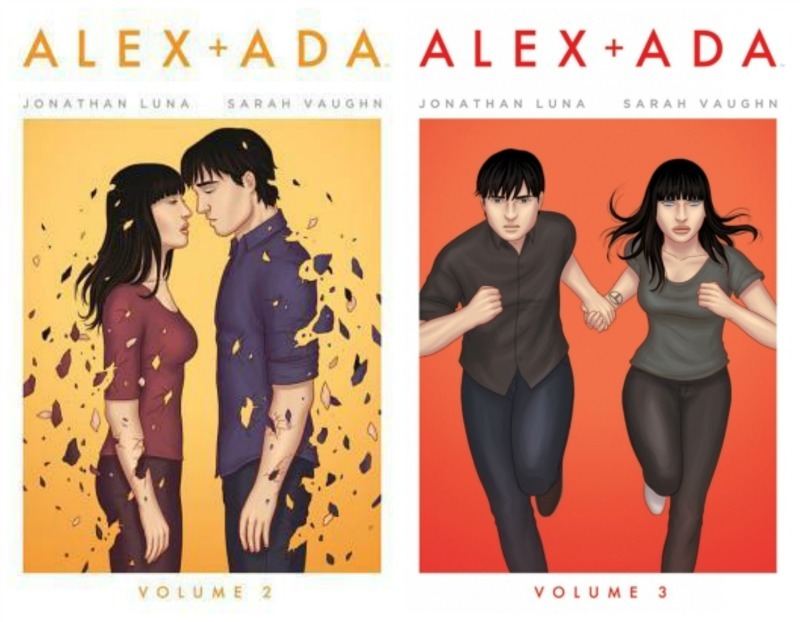 I got these two graphic novels for Christmas, and I read them immediately. The art style is very minimalist, which isn’t my personal favourite, but it does fit the theme and aesthetic of the series. I also like that the story is completely finished after three volumes, rather than going on forever. Together with a bunch of awesome ladies, we are reading Seanan McGuire’s Rosemary and Rue. Every week we will discuss a few chapters based on some questions. This week’s host is Lisa from Over the Effing Rainbow. To find out more about SF/F Read Alongs or to join, check out our Goodreads group. Or, learn more about the book we are currently reading. 1. So, first impressions time! What do you think of the book setup, first of all? Setting, magic system, Faerie in general? The book starts off on such a bittersweet and sad note, I immediately had to read more and see if things ever got better for Toby. Somehow I completely missed that this book was about fae, so all of the different courts and Changelings and magic came a bit as a surprise. Overall, it’s not too hard to keep track of all the elements of the worldbuilding, but I can’t say I feel like I truly *know* the world or the magic system yet. 2. Now let’s take Toby Daye herself. We get to see some of how she’s grown up and how she fits in, or doesn’t, in the modern world as it is post-fish. What are your initial thoughts on her? Hahaha, post-fish. I have to say, having the main character stuck as a fish for fourteen years is a nice change from the boring old amnesia-plot. I feel so sad for Toby. She only had the best intentions, but now she only lives half a life because of what happened to her. I’m looking forward to her finding a place where she belongs. 3. We have yet to properly meet certain characters (Devin and Sylvester), though we’ve gotten brief intros to others (Tybalt and the Queen of the Mists)… Who stands out for you among these secondary characters, and why? The brief time we spend around fae characters such as Tybalt and the Queen intrigue me. On one hand these characters seem to be quite human, but their interactions are based on different rules than human ones. I have the feeling that Tybalt might become more of an ally than an enemy as the series progresses, but I could be wrong. 4. Toby has a murder mystery to solve. Any initial thoughts on the whodunit? So far, I’ve been really enjoying Rosemary and Rue. I’m looking forward to next week’s reading! Have you read Rosemary and Rue? Mira Grant – of Feed fame – has finished another wonderful science-fiction trilogy, proving again that she knows how to write good endings. In the final Parasitology book, the tapeworms are spreading. Countless people are getting infected and turned into mindless husks, incapable of complex thought, ruled by their instincts. It is up to Sal and her friends to save the world – but the world doesn’t seem to want to be saved. An issue that is incredibly prevalent in science-fiction is a lack of character growth and development. More often than not, sci-fi characters are mere sock-puppets, mouth-pieces for the author to express a certain message. Grant (the pseudonym of Seanan McGuire) takes a solid science-based concept, and combines it with characters that feel real. At the core of the Parasitology trilogy lies the story of Sal coming into herself. She is the focus of the books, and Chimera shows the final part of her journey into accepting what and who she is, and finding her place in a broken world. Because so much careful attention is spent on Sal’s development, I felt that some other characters were done a bit short. I would have loved to read more from the points of view of other key characters – the short pieces of autobiographical writing at the start of chapters provided a welcome insight into their minds, but I was left wanting to know more. Like all the other books I have read by Grant, the science in the Parasitology novels is sound. The fact that a character like Sal takes the spotlight does not mean that Grant lets the worldbuilding slide. Chimera is well researched, though the subject matter – parasites! tape worms! – might put people off from reading these books. 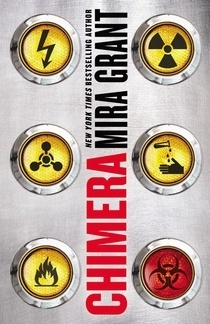 Chimera answers all of the questions raised throughout the trilogy in a satisfactory manner, and has all the elements I look for in a science-fiction. Grant has yet to disappoint me in anything she writes. Sal and her family are trapped between bad and worse, and must find a way to compromise between the two sides of their nature before the battle becomes large enough to destroy humanity, and everything that humanity has built…including the chimera.